Carlos Santana is challenging the NFL to feature live music performances during the Super Bowl halftime show after six straight years of pop music acts accompanied by accusations of lip syncing. The guitar icon – who was featured momentarily during Sunday’s Super Bowl 50 broadcast – took to Facebook to thank the companies for his inclusion before suggesting a local Bay Area lineup could have delivered "real live" entertainment for fans on site and tuned in around the world. 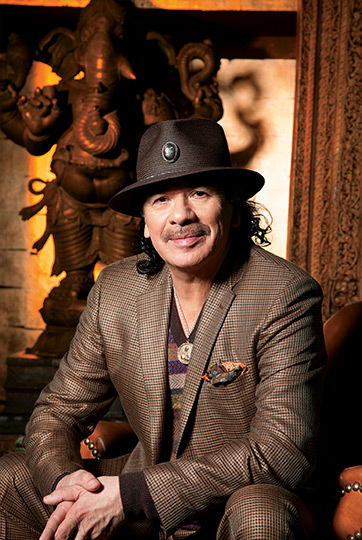 “Dear NFL/CBS, I would like to take this opportunity to thank you both for including me as a part of your Super Bowl entertainment,” Santana writes. “I do feel compelled to point out to you that the Halftime Show should have included some of the local iconic bands that the World would have loved to see perform. Bands like Metallica, Steve Miller, Journey and yours truly. We would have rocked the Half Time Show and done the SF Bay Area proud. The Super Bowl hasn’t seen live rock music during halftime since 2010, when The Who performed at the 44th event in Miami, FL. A lengthy list of pop acts have been booked since – some twice – including The Black Eyed Peas (2011), Madonna (2012), Beyonce (2013), Bruno Mars (2014), Katy Perry (2015) and Coldplay, Bruno Mars and Beyonce this past weekend in Santa Clara, CA. All six halftime shows have been directed by Hamish Hamilton and produced by Ricky Kirshner – the son of US music industry legend Don Kirshner. Red Hot Chili Peppers bassist Flea admitted the band mimed their 2014 appearance with Bruno Mars at the demand of the NFL. As for Santana, he is teaming up with Journey to perform three shows this spring to help launch “Santana IV”, a reunion record featuring members of both bands. Schon and Rolie were members of the band before leaving in 1972 to form Journey alongside former Santana manager Herbie Herbert.